The only way this impacts social media, since the suit is actually against a public television station, is if the Justices use a very broad ruling. Very click-baity article title. It's unlikely the court would decide in either way in a manner that would impact social media. The facts presented in this case are very narrow. Anything is possible. But I doubt this will have much impact on the issues being discussed in this thread. Thanks for posting that, I was trying to track down some recent cases but couldn't find any. Good job. Yay! bigger government control over private business! Right, we are just one step away from the workers paradise after gubment seizes production. Pretty hypocritical of these guys to insist on "the invisible hand of the market" except when it affects them, then they need big government to nanny state them. Buncha babies. The right to refuse service stands with the company. It is not the governments job to regulate that. It’s kinda like if a business wants to be whites only. Well fine they can do that but chances are they will fail. Less government damnit. And with all the people here complaining about Twitter censorship and Twitter in general you would think they would be happy to see it go. So then why support this? If your idea was correct then you should also be unable to espouse certain views in any public forum. Should you not be allowed to disagree for instance to complain about your mayor in front of your local courthouse to other citizens of your town? The idea that these companies are just businesses stops when they become public forums, which facebook and twitter and youtube are. That’s a ridiculous question. My own voice in a public setting is not regulated by a company. If I want to stand next to courthouse and protest I have every right to. If I want to go on Twitter of Bookface and protest they have every right to shun me. Kinda like if I went to a dinner and started to complain they have every right to refuse me service. So let me ask you this. Are you cool with the gubment stepping in and shunning you through overstep of capitalism? 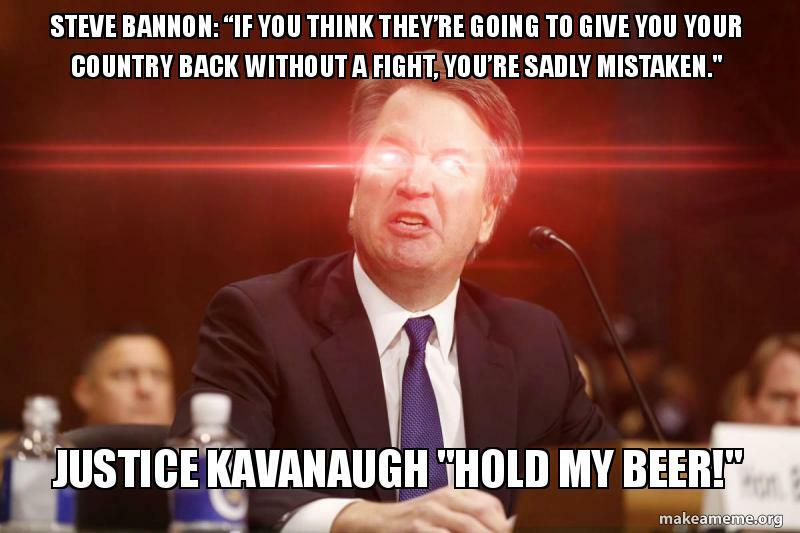 Kavanaugh rumored to be tweeting "it's miller time !!" Remember he always carries that little book with him !! Funny to me that conservatives all of a sudden want the government to tell private businesses how to run their business. Cold day in hell... we've arrived. When a company takes in billions of dollars of taxpayer funded government subsidies, it is no longer a private business. These companies have become the public square, which should be available for the public to use without discrimination or bias just like other utilities. Imagine if telecom companies cut off your cellphone and landline service because you have the wrong opinions. Laws preventing this have been in place for a long time.